We don’t quite know just where to begin when listing the various accolades won by major players Nasty Juice. We could start with their Best Fruit E-Liquid title from back in 2016, awarded at the annual Polish Vape Expo. Or maybe we could open with how they won Juice of the Year, Best Menthol, Innovative Team of the Year and Best Branding – all during 2017. And in 2018 comes, Nasty Juice have racked up three titles, including Vapouround’s highly-prestigious Industry Leader award. 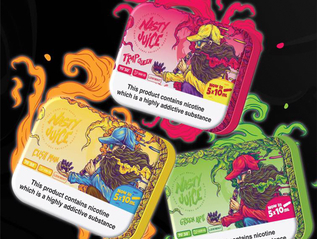 Each and every one of these accolades is well and truly deserved as Nasty Juice are responsible for producing some of the most flavoursome and sought-after vape liquids available on the market. No other manufacturer quite matches the depth and dimension of their fruit and menthol vape flavour profiles, and as such the company has enjoyed continued success since their humble beginnings in 2015. 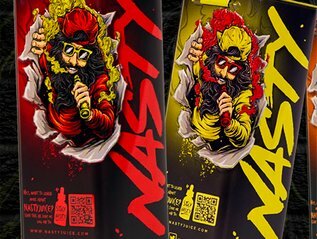 Conceived in Malaysia – the e-liquid capital of the world – Nasty Juice has exploded from its south-east Asian roots to the far reaches of the globe, with vapers in the UAE, USA and Europe all vying to get their hands on the iconic aluminium bottles. Nasty Juice made their presence known with the release of their first series of juices. The collection delivered six vape flavours in a variety of fruit and menthol profiles, with ASAP Grape (a.k.a. A$AP Grape) being one of the collection’s bestsellers both and the time of release and in the present day. A mouth-watering mixture of red grapes, mixed berries and cooling menthol, ASAP Grape achieved a perfect balance between fruitiness and mintyness and left vapers bereft when they reached the end of their bottle! Slow Blow was another obvious favourite from the series as it perfectly mimicked the cooling sensation of a pineapple and lime ice slushy, with just a hint of invigorating menthol on the exhale. Wicked Haze proved wickedly-successful with its bountiful blend of blackcurrants, lemonade and that trademark Nasty Juice menthol, and Devil Teeth had plenty of bite by adding honeydew melons into the menthol mix. If mango is more your thing you’ll want to gorge yourself on the ripe juiciness of Fat Boy which was bursting at the seams with menthol, mango and subtle citrus. When Nasty Juice teamed up with e-liquid giants Kilo the results were a match made in sub ohm heaven. The union yielded two new flavours which were both brimming with mouth-watering fruit mixtures. Dillinger featured ripe watermelon and vibrant honeydew melon, while Gambino was fit to burst with fresh strawberries, sweet orange and a hint of creamy banana. A mini-series of three new flavours was added to the original line-up in 2017, each one matching the phenomenal success of old favourites ASAP Grape and Slow Blow. The juices from the Yummy Fruity series were simple yet delicious and included Cush Man with its notes of juicy mango set against cool menthol. Green Ape featured crisp green apples and mint, while Trap Queen contained layers and layers of luscious ripe strawberries. 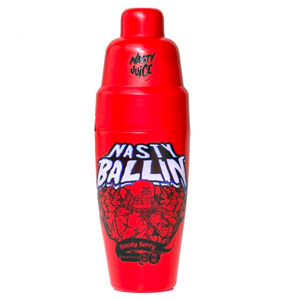 In a move to further appeal to western taste palettes, Nasty Juice released their popular Nasty Ballin’ series without their trademark menthol base, which favoured zingy citrus in place of invigorating mint. Blood Berry featured a delicious blend of tart raspberries and tangy lemon, Migos Moon is a refreshing concoction of lightly sparkling lemonade with a hint of orange and Passion Killa keeps the passion well and truly alive with its intense layers of ripe passion fruit. Hippie Trail is a delicious offering of lemon and lime, making it the ideal all-day vape with not a single trace of artificial flavour. 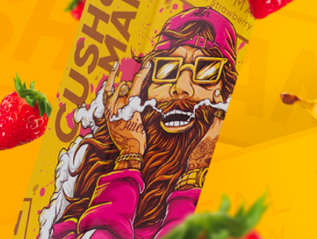 When Nasty Juice noticed the incredible success of their original Cush Man vape liquid, they decided to expand the flavour into a series of its very own. Using the same luscious mango and mind-blowing menthol base as Cush Man, the collection of the same name added strawberry (Mango Strawberry Cush Man), banana (Mango Banana Cush Man) and grape (Mango Grape Cush Man) variations to the delight of fruit-fanatical vapers everywhere. Nasty Juice’s Tobacco Series caters to tobacco lovers who are yearning for a more traditional vape for their sub ohm vape setup. A 70VG composition makes these liquids ideal for heavy-duty cloud chasing, throwing up consistently thick vapour from the first taste to the very last. Prestigiously-packaged in a glittering gold leaf box, Gold Blend is a smooth medley of creamy almonds set against a backdrop of aromatic tobacco. Silver Blend is suffused with sweet fragrant vanilla and tobacco, and Bronze appeals to pudding-aholics everywhere with a wave of rich indulgent caramel intertwined with woody tobacco. 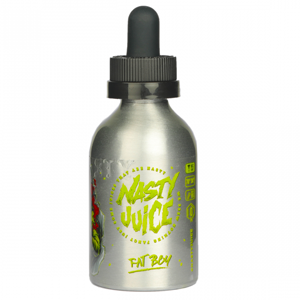 I've been vapin Nasty Juice's Fat Boy liquid as my all day vape since I first found it on vapestore over a year ago and I don't plan on swapping it for another. The Malaysian vape liquids just have best mango flavour !! !